Last month the Government of Canada came out with a new Canada’s Food Guide that is radically different from the old one. This new guide was formed with a lot of public input, whereas previous versions were influenced heavily by industry input, which was evident in the strong focus on dairy, meat and grains. In this blog I’d like to summarize some of the good and bad in the new guide (in case you haven’t perused it yet), and give you some tips on how the guide can be easily modified for gut-health. Canada’s Food Guide suggests filling half your plate with Vegetables and Fruit, 1/4 of your plate with protein from sources such as legumes, dairy and animal proteins, and 1/4 of your plate with whole grains. In addition, it suggests drinking water as your drink of choice. 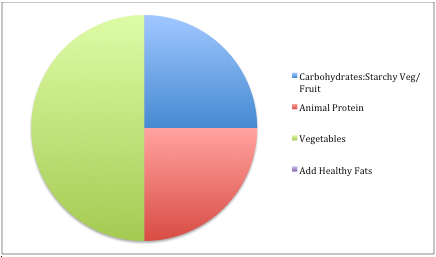 Check out the pie chart below for my Gut-Healthy version. - choose healthy fats: healthy fats are incredibly important, but the Food Guide missed the mark with healthy fat recommendations (see below). Recommended fats that you can keep are olive oil, avocado, fatty fish, and nuts and seeds. For more information on these recommendations go to Canada’s Food Guide and click on Food Choices and Eating Habits. - breakfast recipes included with the guide are very carb/grain heavy. Eating the suggested breakfasts can set you up for blood sugar imbalances for the rest of the day. - corn, canola, peanut, soybean, safflower and sunflower oils are listed as healthy fats, and saturated fats are still considered bad. Butter/ ghee and coconut oil, and saturated fats from pasture raised animals are fats that have many health benefits. Butter is a good source of butyrate, which is important for colon and brain health, and vitamin A (retinol), which supports repair of the gut lining and other epithelial tissues. Coconut oil contains medium-chain triglycerides, which rapidly convert to ketones in the body and provide energy. Ketones can benefit the brain, and improve biomarkers associated with heart disease (1). - the grains and legumes recommended in the Food Guide can be okay for some individuals when they are prepared using traditional methods of preparation that include soaking and sprouting, but these foods are problematic for so many people, and in most cases they are not prepared using traditional cooking methods. It’s pretty easy to fit a Gut-Healthy model into Canada’s Food Guide. I’ve kept the same basic framework of dividing your plate into 1/2 - 1/4 - 1/4, but have switched the contents up a little bit. 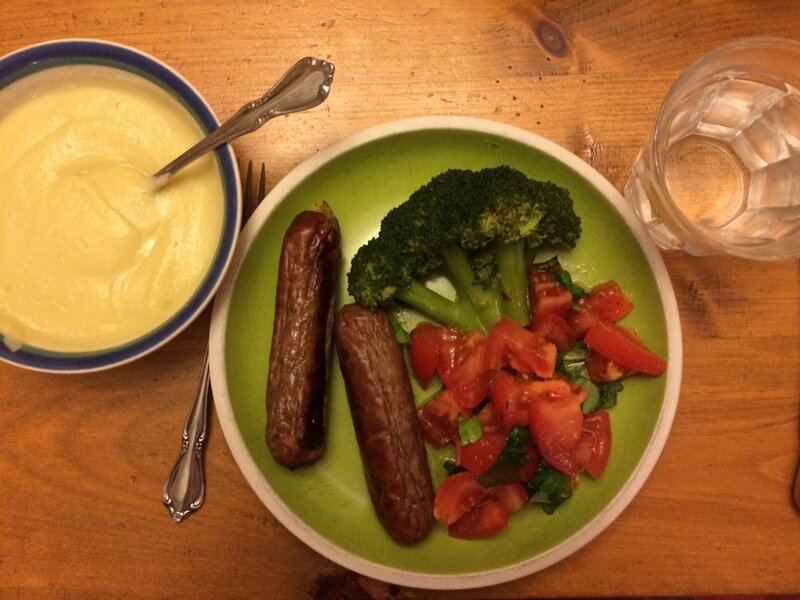 I’ve included some images of my recent meals, so have a look! - Fill half your plate with non-starchy vegetables such as leafy greens, cruciferous veggies like broccoli, cauliflower, turnip, rutabaga and cabbage, or colourful veggies such as beets, carrots, asparagus and squashes. - Fill 1/4 of your plate with animal protein that includes pasture-raised meats, free-range poultry and eggs, and wild fatty fish. Meat stocks and bone broths would fit into this category as an important part of a gut-healthy diet. - Fill 1/4 of your plate with gut-healthy carbohydrates. These will vary depending on what protocol you are on. Fruit fits into this category, and tubors such as sweet potatoes and yams are good if you are on an autoimmune or paleo protocol. If you are on an SCD or GAPS diet, then tubors aren’t normally a part of these protocols, but you may be able to tolerate them cooked and cooled (like a cold potato salad). If you have IBS or SIBO, then tubors are out for now. Honey is well tolerated by most people, and fits into this category. - Add healthy fat to all your meals. Olive oil drizzled over salads or into soups and stews is great. Cooking vegetables in coconut oil or fat rendered from a pastured animal is yummy, and healthy too! Remember that this is a framework to start from. We all have different needs, and you have to listen to your body. If you are thriving on a ketogenic diet, then filling 1/4 of your plate with carbs doesn’t work. If you are struggling with hormonal issues or hypothalamus-pituitary-adrenal dysfunction, then you may need a few more carbs. If you have SIBO, then initially you won’t have any carbs, and will then slowly build the amount up as you undergo treatment with a qualified practitioner. FOR KIDS! : These recommendations are for adults! Children often need higher amounts of protein and carbohydrates, so you can add more fruit, tubors or animal proteins. If you have a picky eater, then don’t worry about specific quantities - just stick with gut-healthy foods. A Gut-Healthy version of the Food Guide changes the sections to Vegetables (1/2 plate), Carbohydrates that include tubors (sweet potatoes, yams etc.) and Fruit (1/4 plate), and Animal Proteins (1/4 plate). The Whole Grain section from Canada’s guide has been changed to Carbohydrates, with fruit and tubors being removed from the Canada’s Vegetable section and put into their own category. Proteins are limited to animal varieties. Water should still be your drink of choice, but I’ve included adding Healthy Fats to your meals. Here’s an example of an AIP or Paleo meal. 1/2 plate filled with Red Cabbage-Carrot-Pea Shoot salad with olive oil, 1/4 plate with a piece of pasture-raised, traditionally cured ham, and a 1/4 plate with a mix of sweet potato and yams roasted in bacon fat. This meal is GAPS and SCD compliant. I have some Sunworks sausage, a Tomato and Basil salad with olive oil, a piece of broccoli, and a bowl of cauliflower soup. Not many carbs here. Had a lot of leftover steamed broccoli! Filled half my plate with broccoli and topped it with an Olive Bruschetta made from olives, capers, garlic and olive oil. The Salmon Patties contain salmon and yam, so are a source of animal protein and carbs. Here’s an example of ingredients for a Blueberry Avocado Smoothie that fit my Gut-Healthy criteria for the new Canada’s Food Guide. 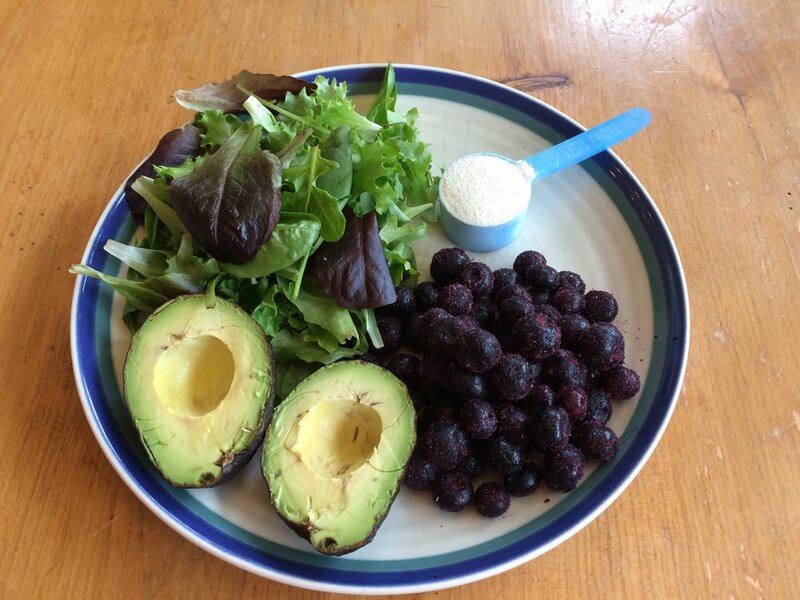 1/2 the plate is filled with leafy greens and avocado (technically a fruit, but since it’s low carb, I include it in my Vegetable section), 1/4 plate with blueberries, and I’ve added a scoop of collagen powder for my protein. The avocado also provides the healthy fat, and makes this smoothie rich and creamy. I just blend the vegetables and fruit up with water, and then add the collagen at the end. As you can see from some of my meals, I end up roughly following the guidelines, but am not a stickler about it. While many of my meals don’t contain carbs, I put honey in my tea everyday, so get some extra carbs there, and I like to indulge in homemade chocolate and coconut or almond flour muffins that are also sweetened with honey. In the summer I eat more fruit than I do in the winter, but in the winter I have more root vegetables, so my sources of carbs vary depending on the time of year. Do you agree with my Gut-Healthy version of Canada’s Food Guide? Let me know if you find it helpful to think of your meals using the 1/2 - 1/4 - 1/4 breakdown as a guideline. It’s cold outside (as I write this there is a nasty wind-chill outside). Do you have plans to travel to a warmer climate this winter? If you are then you need to check out this important guest post! In addition to the information posted below, I always suggest taking along the probiotic Saccharomyces boulardii on your travels in case of diarrhea. Traveler’s diarrhea (also known as food poisoning) can ruin an amazing trip. Besides ruining your trip and causing you to be ill in a foreign country, it has also been proven that around 10% of people who get severe food poisoning will go on to develop post-infectious irritable bowel syndrome (IBS). IBS can dramatically reduce quality of life and cause numerous horrible digestive symptoms which is why it’s so important to avoid food poisoning when traveling. Check out the infographic below which contains everything you need to know to avoid traveler’s diarrhea. This infographic was created by SIBO Survivor, a resource that helps patients heal with SIBO and IBS. I’m squeezing in one more blog article before the holiday season, in case you are like me, and love to give food as HOLIDAY GIFTS. Chocolate is always a holiday favourite, and it’s possible for it to be healthy too! So here is a recipe that is easy to make, that you can package up to give away, or that you can finish off a special meal with. You can feel great about gifting this healthy version! I tucked freeze dried strawberries or pineapple into a few of these chocolates! Candied ginger is also a nice treat to find inside. 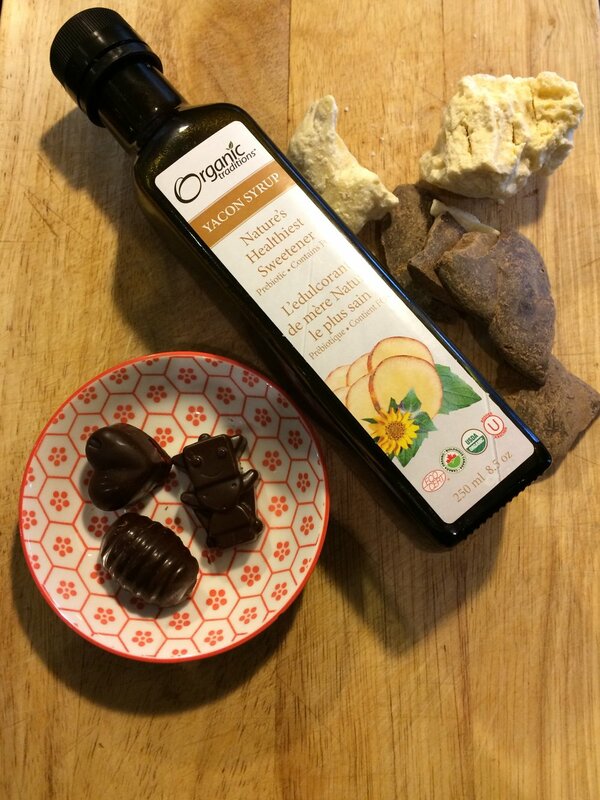 This recipe uses 3 ingredients: raw cacao paste, raw cocoa butter, and yacon syrup. Cacao paste is the least processed form of the cocoa bean next to the bean itself (which you can purchase as whole beans or cacao nibs). It is rich in magnesium, potassium, iron and other minerals, and is a good source of polyphenols, which have antioxidant activity (1). Cocoa butter is the fat extracted from the cocoa bean. Yacon syrup is made from yacon root, which is a root vegetable grown in South America. The syrup’s sweetness is derived from fructooligosaccharides (FOS), which is a prebiotic that feeds beneficial bacteria in the gut. We can’t digest these carbohydrates, so they stay in our gut and are used by our bacteria instead. Since we can’t digest FOS, there are no sugars that enter the blood stream, making this a possible option for people with diabetes (2). FOS would not be suitable for someone with IBS or SIBO as it can aggravate symptoms in individuals with these conditions. Caution should be used for anyone with digestive symptoms such as bloating, cramping or abdominal pain. I’m including a variation for those who don’t tolerate FOS. If the taste of chocolate isn’t enough to tempt you, there are also numerous health benefits that can result from consuming chocolate, including reduced risk of cardiovascular disease, support for the immune system, cancer protection, and as already mentioned, there are antioxidant benefits (3). Place cacao paste and cocoa butter over a double boiler, and melt. Once melted, remove the top section and mix in the syrup. Spoon the liquid mixture into candy molds, and place into the refrigerator or freezer until hard. It only takes about 10 minutes in the freezer. Once it has solidified, remove pieces from the molds, and put them into a container, or gift bag. Candy molds can be found at Amazon or various stores such as Michael’s. The variety of shapes you can find is amazing! You can customize your chocolate shapes to fit the person you are gifting to. This recipe should fill 4 trays. You can replace the syrup with honey. This version is just as tasty, but the honey doesn’t emulsify into the mixture as well as yacon syrup, so you’ll need to keep stirring the mixture as it goes into the molds, and the chocolates need to be kept refrigerated. I make this a lot, and love it, but for gift giving it’s nice not to have to refrigerate the chocolates. Add the 3 ingredients to your shopping list, and put “chocolate making” on your list of things to do! If you don’t have candy molds, the easiest thing to do is order them online, or make a chocolate bark instead by adding your favourite nuts, seeds or dried fruit, and pouring the mixture onto a baking sheet lined with a silicon mat. What’s your favourite way to use chocolate? Happy, Healthy Eating and Gifting! MYTH #1 - I SHOULD EAT A LOT OF FIBRE! There is a lot of truth to this statement, but not everyone should be eating a lot of fibre. The benefits of fibre are well documented and include pooping regularly, feeding your gut microbiome, and helping to clear debris and toxins out of your digestive tract. But fibre can be very irritating to a damaged gut, especially insoluble fibre like that found in bran, whole grains, flax seed and legumes. There are people who should actually be aiming for a low fibre diet. If you struggle with frequent diarrhea, then you should be eating a low fibre diet. Some conditions that can involve diarrhea include Celiac disease, diarrhea-dominant IBS, diarrhea-dominant SIBO, Crohn's, or colitis. Other reasons might include the removal of your gallbladder, a parasitic infection, lactose intolerance, or colon cancer. If you have ongoing problems with diarrhea, then it is important that you visit your healthcare practitioner to dig into the root cause. A dietary approach to address diarrhea includes eating low fibre foods such as meat, fish, eggs, and a lot of meat stock or bone broth. Fermented dairy or coconut products like yogurt and kefir are also good choices. Low fibre vegetables include squash, carrots, beets, and turnips. You can make other vegetables like broccoli, lower in fibre by removing fibrous stems. Once diarrhea subsides, then you can slowly add fibre back into your diet, and reap all of its benefits! MYTH #2 - RAW FOODS ARE BEST! Raw foods can be great, because they contain a lot of enzymes that can facilitate metabolic processes in the body. Nutrients can be hard to extract from raw foods though, especially when your gut health is compromised. You need optimal digestive function for the nutrients to be extracted from foods, and you need a healthy gut lining to absorb those nutrients. Leaky gut has been correlated to numerous chronic health conditions such as autoimmune conditions and systemic inflammation (Source), as well as many neurological conditions such as Parkinson's disease (Source). When your gut is leaky, then the function of your intestinal cells becomes compromised, altering their ability to digest and absorb nutrients. Given that leaky gut is correlated to many chronic health conditions, it becomes important to consume foods in an easily digestible format, and cooked foods allow for easier digestibility. Cooking vegetables can break down cell walls making it easier for your body to extract many nutrients. While some nutritional value is lost during cooking, it is important to consider the state of digestive function overall. When digestive function is compromised, such as when leaky gut is present, then cooking foods ensures that nutrients can be extracted from foods. Raw foods that are still easy to digest include soaked or sprouted nuts and seeds, fermented vegetables, and fermented raw dairy. Once a leaky gut is repaired, and digestive function is optimal, then slowly adding raw vegetables and fruit back into your diet will allow you to benefit from all those great enzymes! 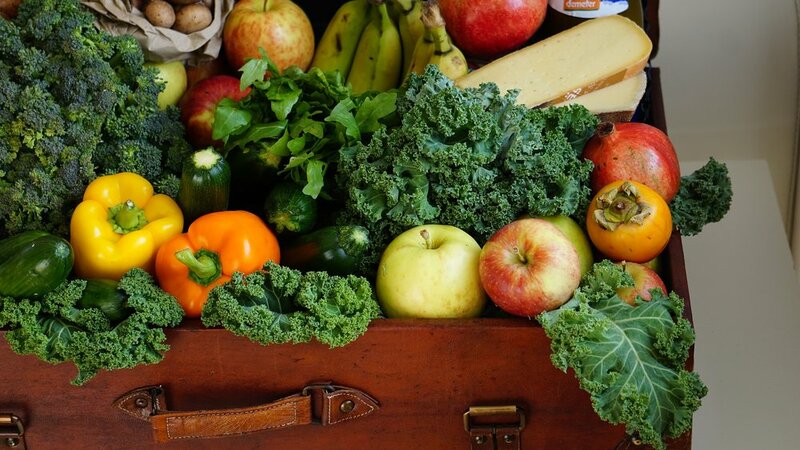 MYTH #3 - A VEGAN DIET IS THE HEALTHIEST DIET! A vegan or vegetarian diet is a great way to detoxify your body, and to bring down inflammation. It can work well for some people, but not if you are dealing with a microbial imbalance in your gut, or if you have leaky gut. Vegan diets rely on a combination of grains with legumes, nuts or seeds to meet protein requirements. The problem with grains and legumes is that they are also high in carbohydrates that will feed pathogenic species in your gut microbiome, and can perpetuate dysbiosis (an imbalanced microbiome). In my clinical practice, I have seen the vast majority of my clients having IgG food sensitivity reactions to a variety of grains, which indicates that the proteins in them aren't being digested properly and are leaking through the gut barrier (leaky gut). Additionally, phytates in grains (Source) and legumes (Source) bind to minerals such as calcium, zinc, iron and magnesium making them unavailable for absorption, so a vegan diet will not optimize mineral intake into your body. Soaking, sprouting or fermentation will make minerals more available, but you will still be left with the high carbohydrate content. You can still have a plant-strong diet that is low in carbohydrates, and that includes animal proteins. Think plant-strong instead of plant-based. If you are vegan or vegetarian for ethical reasons, but suffer from chronic health conditions, then it might be time to switch to an ethically sourced plant-strong diet without grains and legumes. I hope that you are starting to recognize that some of our commonly held ideas about food don't apply to everyone, and may not be right for you. Availability of nutrients is largely dependent on a food's matrix, which is a combination of a food's nutrients, and non-nutrients, along with their molecular relationship to one another (such as the way phytates bind to minerals). This is a growing area of study, and is helping us to bust common food myths. It's important that you eat in a way that supports your health and that is customized to what is going on in your body, especially your digestive function and gut health. Happy Healthy (and customized) Eating! Have you ever had a run of bad luck? Maybe your furnace broke down on a freezing cold day, you were rear-ended while stopped at an intersection, a hidden leak developed in a shower that caused significant water damage to your home…? That was the month of November for me. But more was to come. Ever receive a diagnosis that didn’t make sense? My run of bad luck culminated with a diagnosis of IBS in December. I couldn’t wrap my brain around the diagnosis, or the symptoms I was experiencing. How could I get IBS when I had been eating a gut-healthy diet for over 3 years? I was experiencing EXTREME bloating and constipation that came on rapidly, and were affecting my quality of life. Some nights I couldn’t sleep, because my belly was so distended that it was uncomfortable enough to prevent sleep. Most of the time I didn’t want to eat, because putting even a few bites of food into my stomach caused severe nausea and instant bloating and belching. Week 1: I did a Betaine Challenge, found I was low in stomach acid, and started supplementing with Betaine HCl with Pepsin. This offered a small amount of relief from the bloating. I also took the highest dose probiotic I could get at 500 billion CFU. Each one of these supplements alone should have encouraged motility and helped me poop, but I was starting to become constipated. It didn't make sense. In frustration I went to see my doctor to rule out H. pylori, since my stomach was suffering so much. I got a requisition form for the test and my doctor suggested a low-FODMAP diet to help with the bloating. Week 2: I started a very low-FODMAP diet, in addition to maintaining my usual gut-healthy diet. It helped reduce the bloating significantly, but it was getting harder and harder to poop. By now I was pooping little pellets with a lot of straining. A low-FODMAP diet can be great for managing symptoms, but I knew it didn’t address the root cause of whatever was going on. The problem was, I still had no idea what that could be. As symptoms moved lower into my gut, I added digestive enzymes, and magnesium to see if they would help with the constipation. Magnesium helps to draw water into the bowels making stools softer and easier to pass. Week 3: My H. pylori results were in. Treatment typically involves multiple strains of antibiotics. If my results came back positive would I consider antibiotics? At this point I was so uncomfortable that I was definitely considering it. I knew I could go to my naturopathic doctor for a non-pharmaceutical approach, but I wanted to stop my suffering now. My results were negative, which was a relief, but still left me with the looming question of what was causing my symptoms. My doctor asked me how I felt about the diagnosis of IBS (irritable bowel syndrome). What did I feel? I was frustrated that there was no further exploration, that I didn’t have an answer to why I had these symptoms, and that I was receiving a diagnosis that was vague. I like my doctor and respect him, but was dismayed when he said I’d likely have ongoing problems for the rest of my life. What the heck? At this point I could hardly poop anymore, and was willing to go on an osmotic laxative that draws water into the intestines, but isn’t absorbed into the body. It felt like my entire digestive system was shut down. EUREKA MOMENT: 2 days after receiving the diagnosis of IBS I was sitting in a hot bath after dinner when I had my EUREKA! moment. I knew my gut motility was extremely impaired, and was barely responding to any of the supplements I was using. I kept coming back to the idea that it felt like my entire digestive system was compromised. There was none of the usual tummy grumbling or digestive sounds I normally hear between meals, and I was pooping pellets every other day, so clearly things weren’t moving the way they should. I was managing bloating on an extremely restricted diet. If I didn’t figure things out soon I was certain I’d end up with SIBO (small intestinal bacterial overgrowth). About 10 days before my symptoms started I had been in a motor vehicle accident, and had been rear-ended, and ended up with mild whiplash (remember my string of bad luck?). What if the whiplash was at the root cause of my symptoms? It made perfect sense! The whiplash was a direct physical trauma to the spinal column in my neck. The spinal column is part of our central nervous system (CNS), and the CNS has a huge role in gut motility. Within the CNS there are the sympathetic nervous system, and the parasympathetic nervous system. The sympathetic nervous system is our “fight or flight” system and kicks in during times of danger or stress. The trauma from the whiplash had put me into a chronic sympathetic state! In contrast our parasympathetic nervous system is our “rest and digest” system. You can only have one of these two systems dominate at a time, which means you are either in a “fight or flight” state or a “rest and digest” state. I was now in a chronic “fight or flight” state, which meant I was not able to “digest”. With this new understanding of what was happening in my body, I quickly climbed out of the tub, and called my teenagers to set up the karaoke machine. I was going to sing my gut back to health! What a relief! I finally had something tangible I could do that would help. I was going to start stimulating my vagus nerve! The vagus nerve is the nerve that controls the parasympathetic nervous system. It runs from the brain to the gut (along with numerous other organs), where it is involved in signaling stomach acid and digestive juice production, and motility. And guess what? A symptom of vagus nerve dysfunction is IBS. If my vagus nerve wasn't functioning, then it would explain my symptoms. Singing is one of the ways to stimulate the vagus nerve. I spent the next hour belting out Christmas carols and songs from the 80s with my two teenagers. The next morning I added gargling to the routine, but continued with karaoke. Aggressive gargling is also a great way to stimulate the vagus nerve. Within 36 hours I was feeling noticeably better. The distention in my belly was going down and I had my first normal poop in weeks. Pooping never brought me more joy, than it did at that moment. I stopped eating a low-FODMAP diet. With Christmas just a few days away, the timing couldn’t have been better. I also stopped the osmotic laxative that I had taken for a few days. Over the next week things were up and down. If I forgot to gargle before bedtime, I would still be constipated the next day, so I made sure I didn’t forget. Sometimes I still felt crummy after a meal, but I was improving with each passing day. Right now, two weeks after my Eureka! moment I still gargle in the shower in the morning, and before going to bed. I’m pooping every morning, and I don’t have to strain. All the bloating is gone. I’m still undergoing treatment for my whiplash, so will continue to gargle (or sing) until I’m confident that things have settled down with my nervous system. Do you still have unexplained bloating, constipation, IBS or SIBO? Have you had a physical trauma that included whiplash, concussion or a motor vehicle accident in the past? Start adding loud singing or gargling 3 times each day to see if it helps. Comic book villains are the evil characters that negatively influence other characters in a story, and cause havoc to society. I love watching the Marvel movies with my kids, and my 14 year old daughter is always attracted to the bad guys. She loves Loki in the Thor movies, and we have just finished watching Daredevil (Season 1) and she liked the character Fisk who plays the protagonist. It's her attraction to the duality of these characters that has made me pay more attention to the villains. In your gut story, SIBO could be that evil villain. SIBO (small intestinal bacterial overgrowth) is a lot like those villains . Villains typically have two personas: the one they show to the world at large, and the one that is the criminal or evil persona that only gets shown to some people or gets hidden behind a mask. Catwoman is the perfect example of a masked villain. By day she is a shy, mild mannered woman, but as Catwoman she is lithe and lethal. SIBO is like the masked villain. The masked persona shows up as IBS, Fibromyalgia, Rosacea or symptoms such as bloating, diarrhea, constipation, abdominal pain, nausea, acne, eczema, chronic joint pain, or depression. Unmasked, SIBO is revealed to be exactly what it says it is - an overgrowth of bacteria in the small intestine. Bacterial growth in the small intestine is normal and when that bacteria is in a healthy balance it has several benefits for the body including the production of vitamin K and some of the B vitamins, as well as a role in digestion and absorption of nutrients. When multiple species, or when all species reach a state of overgrowth, then damage occurs to the cells that line the intestinal barrier, and leaky gut occurs. Leaky gut (also known as intestinal permeability) allows large food molecules and toxins to leak into the body, and is a significant factor in food sensitivities, inflammation and autoimmune conditions (Source). SIBO can also result in malnutrition due to an impaired ability to absorb nutrients (Source). Do you suffer from bloating, belching, diarrhea, constipation, nausea and/or abdominal pain, and you have had little or no success with treatment options? Have you been diagnosed with IBS, fibromyalgia or rosacea? Do probiotic supplements make your symptoms worse? If you answered yes to any of those questions, then it is worth getting tested for SIBO. A functional doctor or naturopathic doctor can do a SIBO test for you. If the test comes back positive, then a dietary approach along with an anti-microbial protocol can be used to bring the overgrowth back to a normal state. Some practitioners also use antibiotics, but people are becoming increasingly reluctant to take antibiotics, and there is a high rate of SIBO recurrence with antibiotics (Source). If you have been suffering from chronic health problems, and answered yes to any of the questions above, then it's time to take the next step in understanding who the villain behind your symptoms is. Don't worry, we don't share your information with anyone else. Welcome to the Healthy Apple Blog. Hopefully this feeds your hungry mind!